Let $H$ be a normal subgroup of $G$. 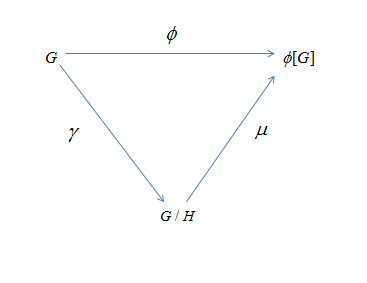 Then $\gamma :G\rightarrow G/H$ given by $\gamma (x)=xH$ is a homomorphism with kernel $H$. so $\gamma$ is a homomorphism. Since $xH=H$ if and only if $x\in H$, we can see that the kernel of $\gamma$ is indeed in $H$.